The Alpine Coach Association, a group of individuals drawn together by their love of Alpine Coaches manufactured by Western Recreational Vehicles, Inc., held its 2007 Heritage Rally in Albuquerque, NM on October 9-13, 2007. A surprise visit from Philip Von Burg, managing partner, Monomoy Capital Funds, and a member of the Board of Directors of WRV, culminated in the association being the first to hear about WRV’s bold new direction to ensure the Alpine Coach gets back into a leadership role in the premium segment of the motor coach market. Monomoy Capital Partners purchased WRV in December, 2006, which has created a new level of excitement and a more focused effort on visionary product development for the entire 2008 line up. Mr. Von Burg outlined a three-step plan for WRV. According to Von Burg, “Step #1 - WRV is going back to its customer driven roots—getting the product right—the right features at the right price. Tremendous product development has been made with the recent launch of the 2008 Alpine Limited SE. The interior ceiling height has been raised, integration of the 2007 emission compliant 425-hp Cummins ISL engine has been completed, and most importantly the 2008 features a single-piece windshield. This improves the looks and the performance of the 2008 Alpine Limited SE. The distinct exterior graphics package, which includes colorful fades and blends, clearly marks the Limited SE as a unit that meets the discriminating buyer’s tastes.” He also hinted that more than new floor plans are on the company’s near-term horizon for the Alpine Coach. 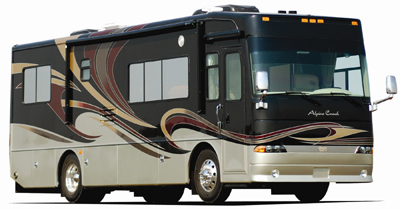 Established in 1969, WRV is a Washington-based RV manufacturer known for its unique products and exceptional craftsmanship. WRV has a dealer network that spans across the United States and throughout Canada. WRV is located at 2900 Sutherland Drive in Union Gap, WA.